I had already decided that the horses would not be going back to La Florentine full time - not having an arena would just make life too difficult for me with two horses to look after. I priced a couple of big establishments in the area - there's a very posh FFE (Fédération Française d'Equitation) approved place in Caseneuve, and another nice place in Buoux which is supposed to be very good. Bigger unfortunately seems to mean "more expensive" too, so I had come to the conclusion that I would lodge the horses in La Florentine for a few months during the year, save a few quid and just do trekking for that time. When we found out we wouldn't be renting La Belle Cour, I stopped thinking about finalising the horses' accommodation while we concentrated on finding somewhere for ourselves to live, although I kept my eyes peeled as we drove around the Provençal countryside, watching out for any signs of horse life. I spotted lots of nice places, but they all turned out to be too far away. Once we finalised the details of renting at Les Granons, though, I went into full "finding livery" mode. The stables I had ear-marked before our visit, Caseneuve and Buoux, were ruled out straight away - they were much too far away from Les Granons. I vaguely knew that there were stables near Reillanne, very close to Les Granons, so that was the first place we actually went to see. It was at the end of a very long, narrow, winding lane, and seemed completely deserted, so after knocking on the door of the little house, we poked around a bit. It was very basic, and arena-less, although there was a lunging ring. The horses were kept in groups of two and three in small paddocks, they all had shelter of some sort, but you definitely got a sort of makeshift vibe about the place. I'm not one to knock Makeshift - I'm a great believer in duct tape and baler twine - but the lack of arena meant it got a big NO. From there, we carried on towards the town of Mane, about 15km from Les Granons, where I had seen a sign for a Centre Equestre at the side of the road. Centre Equestre Pégase looked great! Monsieur (son of the proprieter) greeted me politely and professionally, and introduced me to Madame, who was trimly efficient, smartly dressed in jodhs and a shirt. Madame showed me around. There were two nice big arenas on either side of the drive, a very well fenced lunging ring near the stables, the horses all looked in good condition and in general everything looked really smart. There were plenty of other liveries and a very active Club Cheval - I would not be short of company! The price was a lot cheaper than the places in Caseneuve and Buoux, even though it seemed just as good. I was thinking YES! 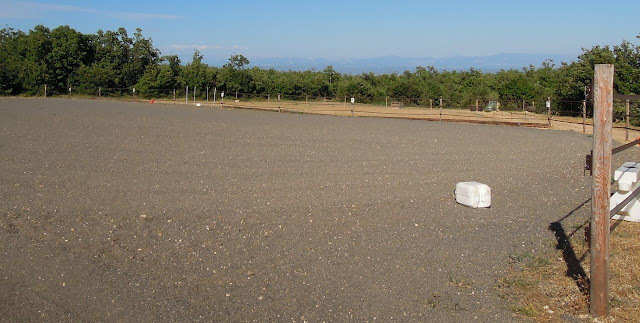 until I saw the paddocks for the livery horses - Flurry and Aero would be kept in a bare paddock, about 20x30 Meters (smaller than a small dressage arena) with a wooden field shelter. One of the things which is essential for barefoot horses is movement, which is why living out works better for them than being stabled. A bigger paddock is preferable - I knew this, after all, I blogged about it in "Our Paddock Paradise." 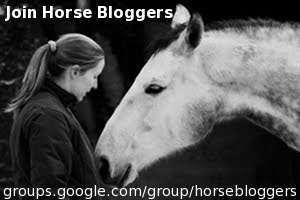 I was having trouble convincing myself that Centre Equestre Pégase wouldn't work out, though, as it seemed so perfect in every other way, so I posted my thoughts on Hay-Net, a really great horsey social network - think Facebook for horse people! Carol, from Horsecarecourses.com, left a reply which put it in a nutshell "Small paddocks can be v. difficult to manage, they turn to mud really quickly in the wetter weather and can get really miserable. If I were you I'd put it on a short list and keep looking." Keep looking? Why not! We still had three days left in Provence! Back to the intenet, google "ecuries" "mane" and what pops up but Écuries de Mane, an FFE approved establishment with a Club Cheval, Poney Club, regular competitions in dressage, jumping and Trec, two outdoor arenas and one indoor - Wow! But strangely, it mentioned nothing about Pension (livery). It was a couple of km further on from Centre Equestre Pégase, so we set off to check it out in person - my French is really not up to phone calls! We arrived in a yard where there were a lot of microscopic children preparing to ride a lot of microscopic ponies, supervised by a teenage girl. She directed us towards "Madame" who was in the office. The whole place had a nice vibe, the horses looked well and seemed to have nice big paddocks and the yard was neat and tidy. Madame was rather large, dressed in a flowing smock and harem pants - quite unusual for a French lady! She was quite désolée (I love that word, literally desolate, but it means "very sorry") to tell me that they didn't do livery at all, but she was genuinely interested in helping me. Was I looking for outdoor livery or indoor? Outdoor? Well, this is the best place, she said, handing me a business card, it even has an arena, although it's a bit small, she added with an apologetic smile. I looked at the card - the address was Reillanne - surely not the place we had already looked at? No, Madam gave us directions, the livery yard was on the far side of Reillanne from Les Granons, so definitely a different place. We made our way straight there, and found it by the simple expedient of matching the picture on the card to a house we passed. The high quality equestrian electric fencing was a bit of a giveaway, too. We knocked on the door and called out Bonjour, but to no avail, so we had a little snoop around. The barn was full of sweet smelling hay, the horses looked content and well-fed and the paddocks were ideal - at least a quarter of an acre, with loads of trees for shelter plus a timber field shelter in each. But where was the arena? Although the paddocks were ideal, "Arena" was number one on my list of requirements. We called back the following day, at a different time, hoping to catch someone at home. Same story, it was completely deserted. This time we snooped a bit more and found the arena! Two, actually, there was a lunging ring too! The main arena certainly wasn't small - it looks slightly bigger than a full-sized dressage arena, and they both had a great surface - grit and rubber granules. There was a view towards the Alpes de Haute Provence to die for, too - magical! It seemed perfect - good paddocks, good arenas and only ten minutes drive away from our new home. We just had to find the owner, to find out the price and, most importantly, if she could take two more horses, but time was running out - we were leaving Céreste in 36 hours. I left a note in the mailbox, with my phone number and email address and we waited. By mid-morning the next day, our very last day, I'd had enough of waiting. I'm just going to have to muddle through a phone call, I said, so I girded my loins, prepared what I wanted to say in my head and rang. I coped fine - she spoke really clearly and carefully, thank goodness. No, she hadn't seen my note. Yes, we could make an appointment. Oh, you have to take your dogs to the vet this afternoon? How about six, so? Ok! So after I took the dogs to the vet for their de-worming (it has to be done before they are allowed back into Ireland) I made my way back to the yard. This time the owner appeared immediately, dressed in jodhs and t-shirt. My first impression was "young" and perhaps a little unsure of herself in dealing with the strange foreign lady who spoke French badly. We introduced ourselves and she showed me around (of course I pretended I hadn't seen it all before!) Here is the arena... the paddocks... she introduced me to the horses... yes, she has a few other liveries, yes they do a little competing but mostly trekking... yes, she could take my two... she is an instructor and could give me lessons if necessary... She asked me about my horses and what I do with them, and she seemed to get a bit more confident talking to me, maybe she had been worried that we wouldn't be able to communicate at all. The price? Cheaper again than Centre Equestre Pégase - woohoo! She would build their field shelter once she knew for sure that the horses would be coming - did I think I would keep them there? How do you say Hell Yeah! in French? You're welcome & thanks for the advice! Wonderful!! and I was laughing about you worrying about a phone call in French because it scares me to death as well. I can communicate pretty well in person but over the phone I'm pathetic. Thank you so much for your comment on my blog! I searched and found the comment you made about Shy's rear end and it was her opposite side. I am so thankful for people who can spot these things. If I had to make an uneducated guess, it would be that Shy is being lazy or she might have a little soreness from working muscles that aren't strong enough yet because she is not used to using them. But I am still going to keep an eye out and as soon as the weather cooperates (we are back to 100 degrees F), Beth will start back riding.